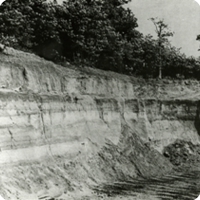 This site is listed in 'A Nature Conservation Review' (edited by D A Ratcliffe 1977, Cambridge) and also includes the Devil’s Kneading Trough Geological Conservation Review (GCR)site. The Devil’s Kneading Trough at Wye is a key site for Quaternary studies, providing detailed lithostratigraphic, biostratigraphic and geomorphological evidence for Devensian Late-glacial and Flandrian environmental changes. Of particular interest is a tufa deposit with molluscan fauna that permits a reconstruction of early to mid-Flandrian (Mollusc zones a to d) environmental changes at a time when the landscape became increasingly afforested. The site is an outstanding geomorphological and stratigraphic locality demonstrating a classic dry valley and associated scarp-foot fan. The deposits in the fan, which overlies a fossil soil and radiocarbon-dated marsh deposits, date from the Late glacial Stadial and represent remarkably intense and rapid erosion, possibly a product of local conditions. The fan deposits and those of postglacial age in the valley floor are particularly important for their Mollusca stratigraphy, which together with the lithostratigraphy, has provided very detailed evidence of changing environmental conditions over a period spanning from the Late Devensian to the present day. Devil’s Kneading Trough is therefore one of the most important periglacial sites in Britain for its classic forms, erosional history and the biostratigraphy and lithostratigraphy of its associated deposits.